Every now and again the sweet chime of the church bells can be heard calling out across the township of Yass. Mostly, the sound goes unnoticed, other times it is taken for granted. On a still afternoon, the bells can be heard to reach as far as the Yass Service Centre. While the sound is peaceful, gently humming the air, standing just 10 meters beneath the kilos of bronze, with puffed out cheeks and brows glistening with sweat, six people hold tightly to the ropes of the church bells. The hobby is called campanology, a word with a nice ring to it, but most folk call it bell-ringing. 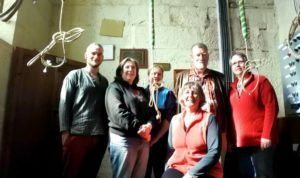 The art of Bell ringing: Alex Rose, Raelene Hall, Fiona Vickery, Chris Rose, Peter Rose and Stella Murphy get ready for their rehearsals. Photo; Jessica Cole. Regardless of the temperature – the St Clements Church reaching a few degrees over winter – the eight Yass residents and one Canberra man meet each week to practice their art. 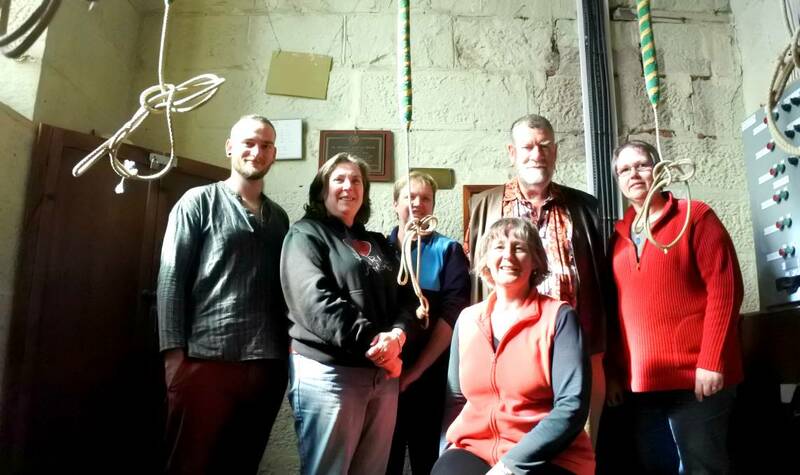 “Ringing is a complex art; learning it takes both time and strength the church’s bells weigh hundreds of kilos,” the church’s tower captain, Ted Reid said. Ted has been ringing for decades, tuning his skills to a standard that earned him the chief position in the bell room. The group meet each Thursday evening and again for certain ceremonies, or significant events. He keeps a watchful eye on the team, “Whip it through, keep that rope moving,” he says as they progress through methods – The name given to the bell ringers tune. Ted spearheads the Yass group of the ancient practice that is rare in most towns, regardless of it’s unusual study, it ropes in enthusiasts from outside its traditional circles, male and female, young and old. Though it is not essential to be “musical”, skilled ringers generally have a heightened sense of rhythm, a good memory and particularly good hand-eye co-ordination. Each bell is attached to a wheel that is turned by pulling on a rope. Controlling the wheel and the swing of the bell is the bell-ringer’s role. While some might describe the gathering as a form of band practice or rehearsal, others argue that their hobby is a sport because it is competitive and physically difficult. While it is an unlikely contender for the latest fitness fad, although it is said to help coordination, improve agility and tone a range of muscles, it also comes with a certain kind of culture. Like most hobbies, it is a great way for people to structure a holiday. People coming from around the world to ring the bells of Yass. Next time you hear the bells at Yass consider the people giving their time to make this happen.